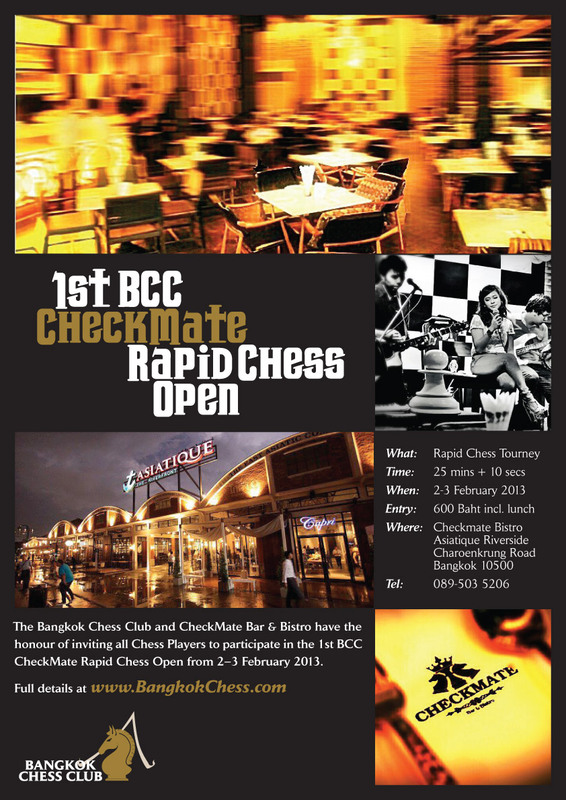 The Bangkok Chess Club and CheckMate Bar & Bistro have the honour of inviting all Chess Players to participate in the 1st BCC CheckMate Rapid Chess Open from 2nd to 3rd February 2013 in Bangkok. This is an individual tournament, open to all players. The maximum number of players is 80. FIDE (International Chess Federation) rules and regulations shall apply. Results will be sent for FIDE rating calculations. Tournament will be played using the Swiss Pairing System over 7 rounds. For the pairings, a Swiss Manager computer program will be used. Each player is accorded with a time control of 25 minutes plus 10 seconds per move. Five minutes before the games start, the Chief Arbiter shall make the announcement accordingly. Mobile phones or other electronic devices must be turned off in the tournament hall, any violation shall result in loss of game. There will be cash prizes for the first three players, and the first prize will be Baht 5,000. All other prizes, including best juniors, will be published 1 week before tournament starts. Chief Organizer and Tournament Director is IO Kai Tuorila, Deputy Director Peter Darby. Chief Arbiter IA Panupand Vijjuprabha (in the event of dispute the Chief Arbiter’s decision is final). Baht 600 (late registration after 27 January is Baht 800). All tournament fees must be paid before the start of the first round. The entry fee includes buffet lunch at CheckMate on both days. 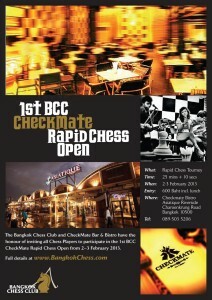 Registration can be done by email to K.Kai or to K.Panupand , or at the Bangkok Chess Club on Tuesdays and Fridays. Registration email must include full name, birthdate, country and fide rating (if any). The deadline for registration is January 27, 2013. After this a late registration charge will be added. However, organizers reserve the right to refuse or decline late registrations. 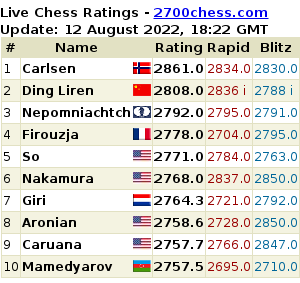 The maximum number of players is 80, and maximum 60% can be non-fide-rated. Tournament results and pairings will be updated daily to www.chess-results.com. Time to seek the Title Norms?